Innovation is a hot topic in the wine industry these days. While some wine brands can depend upon their traditional markets, messages and products, many producers find themselves under increasing attack from “the crafts” — craft beer, craft cider and craft spirits. One advantage that these alcoholic alternatives seem to possess is the heightened ability to adapt, evolve and excite — to innovate in various ways that keep customers coming back to see what’s new. How wine got in this situation is a long story that I will tell another time and whether wine should even enter the innovation wars is something that is hotly debated. Some new wine products have been criticized as “pop wines” that debase and therefore threaten the whole product category — not a view that I endorse, but I can understand the concern behind it. So I was very interested in looking at innovation during my visit to Portugal and I found it in many different forms. I thought you might be interested in a little of what I discovered. Port, which is arguably Portugal’s signature wine, is an example of a wine category that is both timeless and highly innovative. Timeless in the sense that Port wines have in many ways remained much the same for several centuries. White Ports, Ruby Ports, Tawny Ports — in fundamental respects these are the same today as they were 100 or 200 years ago. Almost nothing is as traditional as Port, with its stenciled bottles and historic brands. This is a plus and also a minus. The plus of course is brand recognition — only Champagne was a stronger brand than Port from a name recognition standpoint. But it’s a minus, too, because that brand, like Sherry, is wrongly associated with one-note sweet wines. Like Rodney Dangerfield, they sometimes don’t get the respect they deserve. And it is a minus because the traditional Port wine styles are exercises in patience in a very impatient world. Tawny Ports must be held by the maker until they are mature in 10, 20 or even 40 years. That’s a lot of time to wait with the investment time clock running. Vintage Ports need time, too, but this time the buyer is expected to patiently wait for the wine to mature. Time is Port’s friend because of what they do together in terms of the quality of the final product but, from an economic and market standpoint, time is also an inconvenient enemy and seemed to limit Port’s potential in the postwar years. The answer to the time problem was an innovation that appeared in 1970, when Taylor Fladgate released their 1965 Late Bottled Vintage (LBV) Port. LBV has the character of Vintage Port but is ready to drink when released, not 20 years later. It was not quite the Chateau Cash Flow killer app of the wine world, but it certainly breathed new life into the Port market at a moment when this was especially welcome. Some say that LBV saved the Port industry and I think this might be true. Red and white are the traditional colors of Port, but recently some makers have innovated to try to get the attention of younger consumers who have as little interest in their notion of grandfather’s Port as they do in their stereotype of granny’s Cream Sherry. Croft Pink Port and Quinta de Noval Black Port are examples of this innovative trend. Pink Port is made in a Rosé style, with less skin contact and therefore fewer grippy tannins than Ruby Port. The Croft website is fully of cocktail ideas so perhaps this is a Pink Martini killer wine? Richard Hemmings, writing on the JancisRobinson.com website, makes the wine sound like an excellent option for the many Moscato lovers in your life. So far I have focused on product innovation but I haven’t mentioned process innovation and that is a mistake ,as I learned from a winemaker during my stay in Porto. George Sandeman of the famous Port & Sherry family invited me to taste through the Ferreira line of wines and Ports and of course the Sandeman Ports. How could I resist? Even better, we would be joined by Luis Sottomayor, Porto Ferreira’s award-winning winemaker. The bottles and glassware filled the big table as we began to taste through the Casa Ferreirinha wines then the Ferreira and Sandeman Ports. The wines were eye-opening. From the most basic wines selling for just a few Euro on up to the super-premium products they were well-balance, distinctive and delicious. Not all the Portuguese wines that make it to the US market have these qualities. I have a star in my notebook next to the entry for the Casa Ferreirinha Vinha Grande Red 2010, for example. A blend of classic Portuguese grape varieties from two Douro regions, it spent twelve months in second the third use oak. Easy drinking, soft tannins, nice finish, classy, well-made. Cost? About Euro 10. in the home market or $19.99 in the US. “Delicious” I wrote next to the note for the Casa Ferreirinha Quita Da Leda Red, which comes from an estate vineyard just 1 kilometer from the Spanish border. It is the product of a small winery located within the company’s larger facility. Spectacular wine, special terroir, I wrote. US price is $64.99 and worth it. As we tasted through the Ports I started to talk about innovation — Pink, Black and so on. Sottomayor stopped me in my tracks. If you want to really understand innovation in Portugal, he said, you have to look beyond new products to the work that is being done to improve the process in the vineyard and the cellar. This is where the real gains are, as seen in the table wines I had just tasted and the Ports I was about to sample. Taste this LBV, Sottomayor said. The LBVs we make today are of the same quality as the Vintage Ports we made 15 years ago. And the Vintage Ports are that much better, too. New products are part of the story of Portuguese wine innovation, but improved winegrowing and winemaking are just as important now and probably more important in the long run. Lesson learned! I came away from the tasting described above both richer and poorer. Richer because Sottomayor’s lesson about innovation will save me some money — as much as I enjoy Vintage Port and will continue to buy it, I now have LBV centered on my radar screen and it sells for a good deal less. And poorer? Well, Sandeman and Sottomayor set up a little experiment for me, first letting me taste their 10-year old Tawny Ports and then the 20-year-olds. We like the 20s, George Sandeman said, because you can taste where they’ve been (the 10-year old wines) and also where they are going (the 40-year old Tawny that I tasted next). The tension between youth and old age makes the 20-year old Tawny particularly interesting, he said. And I am sad to say that I could taste exactly what he was describing. Sad? Yes, because 20-year old Tawny costs a good deal more than the 10 and for the rest of my life I am going to be paying that extra sum! Congratulations to George and Luis on the great ratings that their 2011 Vintage Ports have received! And thanks to them and to Joana Pais for their help and hospitality. It’s been a busy week so far. My new book Extreme Wine has just been released. 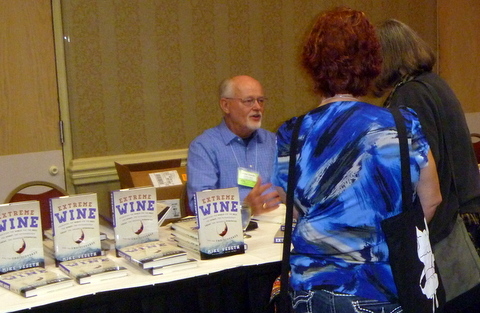 Sue and I traveled to Portland, Oregon for the Pacific Northwest Booksellers Association trade show where I autographed 75 copies of Extreme Wine in 75 minutes before we ran out of books. My column has an unexpected “hook:” a 2010 episode of the U.S. television show “Pawn Stars” that featured a bottle of 1921 Dom Perignon. You’ll have to read the article to get the whole story, but basically I use this example as a way to talk about how investing in wine is different, in terms of financial economics, from other types of investments. It’s an unlikely approach, but I think it works. We so often hear about the benefits of wine investments or the problems with it in only a very general way. I’m interested in doing more serious comparative analysis, while keeping the mood light. If you’ve seen the show “Pawn Stars” you know that you can actually learn a lot of history through its often funny “reality TV” stories. My column also comments and reports on some recent trends in wine investment. Hope you’ll check out my column. Here’s a photo from the Portland book event. Great to see all of independent booksellers (God bless them! ), publishers, authors and volunteers (bless them, too) in Portland. This post is provoked by Andrew Jefford’s now-famous speech “The Wine Writer is Dead,” which he gave at a meeting of European wine bloggers in Izmir, Turkey last month. It’s a great speech, full of wisdom and insight — click here to read the written version on Jefford’s website. Jefford’s title made me think of the famous scene in Mondovino (see video above) where Aimé Guibert declares that wine is dead (and cheese and fruit, too). It seems to me that Guibert’s obituary for wine was based on the fact that people try to make a living from wine in an increasingly global and competitive market environment and this changes things, although perhaps not as much as Guibert suggests since money and wine have always intermingled and it is foolish to pretend otherwise. Jefford talks about the problem of making a living, too, and the changing writers’ market environment, but he doesn’t suggest that wine writing has lost its soul in the way that Guibert mourns the death of wine’s essence. Certainly it is difficult to earn a living writing about wine, especially with the decline in paid print-media jobs, he says. So wine writing has evolved into something broader — wine communications — which seems to be about story telling in all its forms using all available media outlets. “The world probably doesn’t need more writers … [but] the wine world will always … need multi-tasking communicators …”. I tend to agree with Jefford that telling stories about wine is much more than simply writing for print publications, but I wonder if wine writing has ever really been such a narrow and focused endeavor as he describes? He’s been at this longer than I have, so I suppose he is right, but my sense is that the his distinction between wine writing (RIP) and wine communicating is not so sharp as he suggests and that if wine writing has died it probably did so a long time ago. In any case his point — that people who tell stories about wine should seize every opportunity to do so — is certainly well taken. Is the Wine Reader Dead, Too? I’m not really worried about whether wine writing is dead or alive. I’m more interested in wine reading, which I specifically do not define as reading about wine exclusively in paid (generally print) publications. Wine reading seems to be changing dramatically and that’s the more interesting trend. Unsurprisingly, I tend to think about this in economic terms. Economists who study the economics of food choice believe that a key factor in the growing consumption of high fat fast food is cost — fast food is relatively cheap both in terms of money and time, which are strong economic incentives. Even when healthier food is available and consumers understand something about nutrition the economic incentives push and pull them into the drive-through lane on the margin. I think the economics of readership (and wine readership) works the same way. I’m not saying that writing on the internet is the intellectual equivalent of “empty calories, ” but the shift of readership from traditional print publications to electronic media is influenced by economic incentives (as well as other factors of course). Electronic texts are obviously cheaper in terms of marginal dollar cost since most of them are available free on the web and even the electronic versions of books are often cheaper to buy than the print versions. And you can often access electronic documents in a fraction of a second rather than the minutes, hours, days or weeks that it might take to get a copy of a print publication. Fast beats slow in a time-constrained world just as cheap beats expensive when money is scarce. No wonder readership patterns are changing. The shift is magnified by the technology associated with electronic publications — especially tablets and smartphones. I may have already told you about my university student who explained to me that he was going to do his senior year on his smart phone — all his reading and writing would be iPhone-based or not at all. He succeeded after a fact, which I found a bit shocking. Shifting from iPhone to iPad, I think he might succeed quite well today and there’s nothing shocking about it. Reading has always been as much affected by economics as writing. Imagine the chaos created by the introduction of paperback books in the 1930s (or read about it here). Some observers predicted that paperbacks would be the death of the traditional book world, but in fact it seems that they ended up creating more readers and therefore more writers, too. Follow the readers. This seems like good advice and I think it is Jefford’s’ point as well. The readers (and viewers and listeners) are shifting, responding to technological change and the altered economic incentives they confront. Writing has to do the same in order to stay relevant, and if a certain idea of wine writing (or writing in general) is a victim of the changing times I think we have to accept that and move on. Joseph Schumpeter called this sort of process creative destruction and we need to take account of what has been created as well as what is lost. Jefford understands this, although he doesn’t put it quite this way, which is why I recommend his talk to you. It seems to me that there are probably more wine readers today than ever before in history, which is good news for wine writing, however you define it. 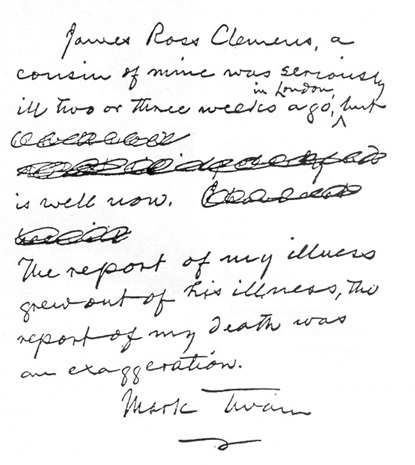 As Mark Twain might have said, reports of its death are exaggerated. It’s the time of year when wine writers give advice about what to serve with Thanksgiving dinner. 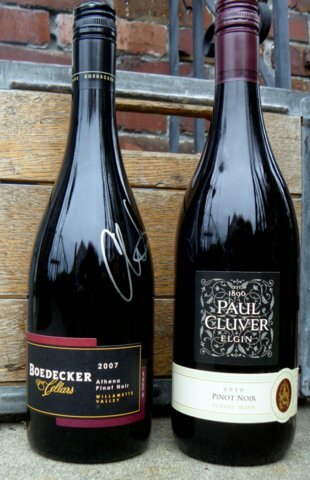 The wine of choice here at The Wine Economist will probably be Pinot Noir that I received in friendly books (Wine Wars) for bottles exchanges with the winemakers themselves: a 2007 Boedecker Cellars “Athena” from the Willamette Valley in Oregon and/or a 2010 Paul Cluver Pinot Noir from Elgin in South Africa. I think they will be delicious with the traditional turkey and fixin’s. What’s the best part of Thanksgiving? Leftovers are the best part for many of us. Hard to beat the turkey sandwich that you enjoy the next day when the cooking (and clean up) are done. And for some people the best part of Thanksgiving isn’t Thanksgiving at all — it’s the day after, which we ominously call “Black Friday” in the United States. Here, in the flexible spirit of the holiday, is a leftover column about Beaujolais Nouveau and Black Friday, reprinted from The Wine Economist November 23, 2009. Enjoy! A Wine for Today’s Thanksgiving? Although the United States is not the only country to set aside a day for giving thanks, we like to think of Thanksgiving as our distinctive holiday. It was conceived as a day for deep reflection, but Thanksgiving has evolved into a long weekend of over-consumption and discount shopping. Some of my friends really prefer to celebrate Black Friday, the day after Thanksgiving, when the holiday shopping season formally begins and retailers find out if they will be “in the black” for the year based upon early sales data. 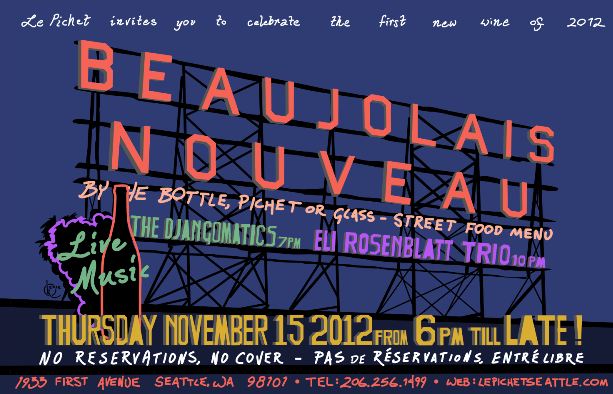 If you plan an Old Time giving-thanks Thanksgiving, then [Beaujolais] Nouveau is not for you. It is not an especially thoughtful wine. It is a sorta soda pop wine; if wine were literature, my friend Patrick points out, Nouveau would be the trashy paperback novel you read at the beach. Nothing wrong in that — everyone needs an escape once in a while. The grapes for Nouveau are picked in late September or thereabouts and the only thing that prevents instant sale is the necessity of fermentation and the mechanics of distribution. It’s still a bit sweet when it’s bottled and sometimes a bit fizzy, too, when it arrives with great fanfare on the third Thursday in November (a week before Turkey Day). Best served cold (like revenge!) it is the ultimate cash flow wine. Nouveau is not very sophisticated, so why do the French, who otherwise are known to guard their terroirist image, bother with it? The Beaujolias producers make very nice ordinary (non-nouveau) wines; character complexity, you can have it all and for a surprisingly low price. Ah, but that’s the problem. Sitting close to prestigious Burgundy, the Beaujolais cannot command high prices for their wines, good as they are, so they must try to make money through turnover more than markup. They churn out millions of bottles of Nouveau to pay the bills. At the peak of the bubble in 1992 about half of all wines made in Beaujolais were Nouveau. The proportion remains high even today. Ironically, Nouveau often sells at prices as high as Beaujolais’ more serious wines because it is marketed so well. So it is hard to see why you’d want to buy it instead of the region’s other wines. It’s easy, on the other hand, to see why you’d want to sell it. Beaujolais Nouveau, it seems, is France’s Black Friday wine! If the makers can sell their Nouveau, then maybe the bottom line for the year will be in the black. If the Nouveau market fails, well that red stain on the floor won’t be just spilled wine. Nouveau is usually distributed around the world via expensive air freight rather than more economic sea transport in part because the short time between harvest and final sale makes speed a factor. This year  Nouveau was bottled in plastic for the Japanese market in part to lower shipping cost — a controversial move that may not be repeated because of its negative product image potential. Sweet, fizzy and packed in PET bottles — Beaujolais Nouveau sounds like the perfect wine for American consumers brought up on 2-liter jugs of fizzy-sweet Mountain Dew and Diet Coke. If you were kinda cynical, you would think Nouveau was an American wine … made in USA. And it is, in a way. Although the wine obviously comes from France (and there is actually a long tradition of simple and fun early-release new wines in France and elsewhere), I think it is fair to say that the Nouveau phenomenon is an American invention. W.J. Deutsch & Sons, the American distributors, really put Beaujolias in general and Nouveau in particular on the U.S. wine market map when they became exclusive distributors for Georges Duboeuf some years ago. 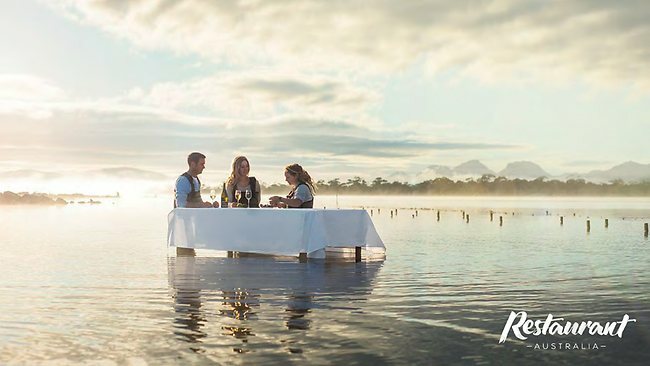 They took this simple wine and made it a marketing event. To paraphrase an old Vulcan proverb, only Nixon could go to China and only the brilliant Deutsch family could sell Nouveau! In fact they were so successful that they partnered with another family firm — the Casella family from Australia — and created a second wine phenomenon tailored to American tastes: Yellow Tail! So although Nouveau is an American wine of sorts and might be perfectly crafted for this American holiday as we actually celebrate it on Friday, I’m going to pass this year (on Thursday, at least) and see if I can nurse some thoughtful reflection from my holiday glass [of Pinot Noir!] instead. Cheers, everyone! And thanks. Thanks to Athena and Paul for the nice wine — hope you enjoy Wine Wars! I’m working on the two chapters of Extreme Wine about wine and popular culture — celebrity wine and wine in film, television and on the web and I thought I’d share some of my discoveries with you and, as always, ask for your feedback in the Comments section below. Sideways and Bottleshock are the two best-known wine-centered films, but here are three others for your consideration. Grenouille d’hiver means “Winter Frog” and it is the title of a short film by the director Slony Sow that was first broadcast on French television in 2011. It is making the rounds of film festivals, including Cannes; I haven’t seen it yet except for the short trailer on YouTube. It stars Gérard Depardieu in an emotional role. “Benjamin, grower, sees his wife die in his arms following a long illness. Only one way out for him: death. But a young Japanese girl, came especially for its wine tasting, will bring it gently to mourn a series of symbols and exchange between two cultures,” according to the film’s official synopsis as quaintly translated from the French by Google. Gérard Depardieu has played many roles in his long career – over 170 of them since he began in the 1960s according to his French Wikipedia page. He’s played everything from Cyrano the big-nosed patriot of the Edmond Rostand play to Oblex the big-nosed patriot of French cartoon fame. He’s worked with iconic directors like Francois Truffaut and won most of the top awards including the César and the Legion of Honor. He is scheduled to portray libertine French socialist politician Dominique Strauss Kahn in an upcoming film. That should be interesting! Depardieu has played so many characters for so long that there might seem that Benjamin would be just another role. Except that the vines he stands among as he contemplates harsh fate and his own mortality are actually his own on his vineyard estate in Anjou. And I’m pretty sure the wine he sips with the young Japanese visitor, which opens the door to grief, is his too. Depardieu has owned Chateau de Tingé in the Coteau du Layon appellation since 1989. He owns the estate, which includes a 14th century castle, and oversees things generally in the way that a busy global media star can, leaving the actual winemaking to an old friend. The film seems to be an interesting commentary on wine’s ability to store and release feelings and its power to transcend language. I’m looking forward to seeing all 18 minutes of this film when it finally becomes available. The second film is completely different and yet manages to strike some of the same notes. I’m talking about Stanley Kramer’s 1969 The Secret of Santa Vittoria, which is based upon Robert Crichton’s best-selling novel. It stars Anthony Quinn, Anna Magnani, Virna Lisi, Hardy Kruger and Sergio Franchi. The entire two-hour plus film is available on YouTube — just click on the image above to watch as much or as little as you like. The setting is a sleepy Italian town in the closing months of World War II. The film is played as a romantic farce with town drunkard Quinn unexpectedly elevated to mayor just as German troops approach, intending to occupy the village and seize its only important asset — more than a million bottles of the local cooperative’s wine stored in the cellar under the town hall. With Quinn as their leader, the townspeople risk death to save themselves by saving their wine, hiding it in the old Roman caves beneath the city. This act brings the divided town together in a way that probably nothing else could do, making the deception’s ultimate victory all the more miraculous. Great fun! Documentaries tend to be uneven and so is this film — the characters who get the most screen time aren’t always the funniest or most interesting but it all comes together in the end. The romantic image that we cultivate about wine and wine making (see films above) is a bit of a fraud. It isn’t a complete fake as Corked! suggests (by definition satire needs to go over the top), but it’s not a completely noble calling, either. Wine is about people and relationships (the point of all three films, I suppose). No wonder it is so complex. No wonder it translates so well to film.